Beihai (Chinese: 北海; pinyin: Běihǎi) is a prefecture-level city in the south of Guangxi, People's Republic of China. The name of the city means "north of the sea" in Chinese, signifying its status as a seaport on the north shore of the Gulf of Tonkin, which has granted it historical importance as a port of international trade for Guangxi, Hunan, Hubei, Sichuan, Guizhou, and Yunnan. Between the years 2006 and 2020, Beihai is predicted to be the world's fastest growing city. Beihai has a large shipyard, but most of the money generated in the city is derived from trade. In addition, it governs the small islands of Weizhou and Xieyang, and is directly west of Leizhou Peninsula. After the 1876 Sino-British Treaty of Yantai, eight Western nations (the UK, US, Germany, Austria-Hungary, France, Italy, Portugal, and Belgium) set up consulates, hospitals, churches, schools, and maritime customs. Today, 15 of these western buildings remain in Beihai. It officially became an international tourist spot (旅遊對外開放城市) in 1982. December 4, 1949: Beihai became a town of Hepu County under the Communist Party of China . Vernacular languages of Beihai include Qin-Lian Yue, Hakka and Min. Mandarin is of increasing prevalence as a result of the Chinese government's general promotion of it. Beihai is served by Beihai Fucheng Airport (BHY). It serves domestic destinations and also Hong Kong. Beihai is served by a railway branch from Nanning. There are passenger trains to Nanning and Guilin. At the end of 2013, the introduction of high-speed (D-series) train service to Beihai was announced as well. 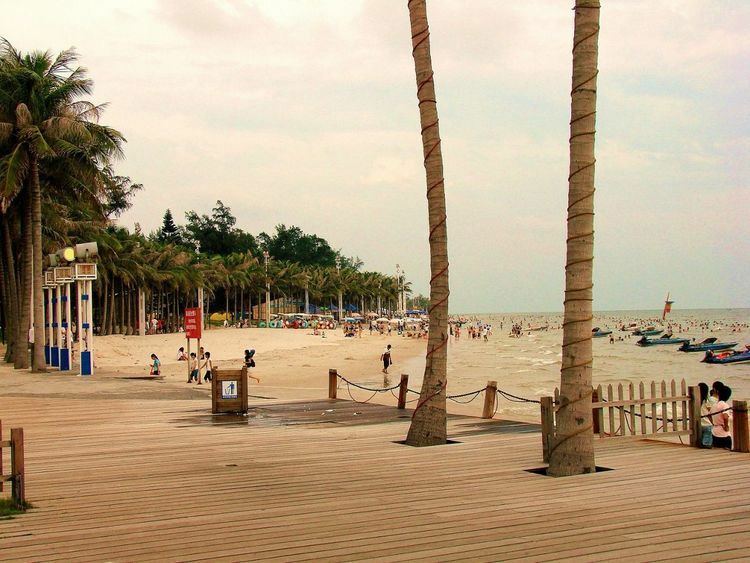 Beihai has a monsoon-influenced humid subtropical climate (Köppen Cwa), with mild to warm winters and long, hot (but not especially) summers, and very humid conditions year-round. The monthly 24-hour average temperature ranges from 14.5 °C (58.1 °F) in January to 28.8 °C (83.8 °F) in July, while extremes have ranged from 2.0 to 37.1 °C (36 to 99 °F). Rain is both the heaviest and most frequent from June to September, when 70% of the annual rainfall also occurs. This is in contrast to the autumn and winter months, where only 20 to 40 millimetres (0.79 to 1.57 in) of rain falls per month. The area receives about 2,000 hours of sunshine annually.